(WDTN) - Dayton police officers shot and killed a neighborhood dog, and injured two others. The dog's owner says five of her dogs got into a big fight, prompting her neighbor to call the police. She says she wasn't injured during the fight - but her neighbor was under the impression the dogs were attacking her. It happened on Wyoming Street, earlier this afternoon. Owner Alexis Keeton says it started out when two of her dogs began fighting over food. "I was scared. I was panicking. I was hysterical, really. I didn't want them to shoot," Keeton said. "I mean I knew what was going on their heads. They had to, they had no choice. But I was scared for their lives, mine, I was standing right there when they just started shooting." Keeton says she was hysterical. She says she was trying to separate her dogs, but couldn't. "I tried getting behind them and pulling them apart," she said. "I was also scared that one of them would attack me." In a 911 call released by police. 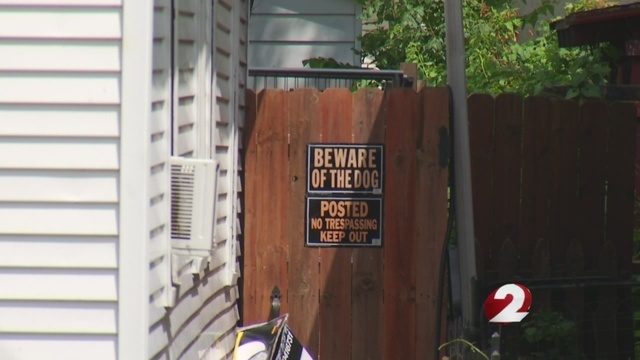 The neighbor tells dispatch: "My neighbor is screaming that her dog's attacking her." Keeton says police responded, and opened fire. One of the dogs is dead, two others are at the vet - one in critical condition. Keeton says she doesn't blame the police for what happened. "They did the best they could and they helped me out as much as possible," Keeton said. "If it wasn't for them I don't know what would have happened." THE DOGS ARE AMERICAN BULLIES AND A RED NOSE PIT. Keeton said although her dogs have fought each other, once before - it's never been this extreme. "My boyfriend's had all of them his whole life - they're four years old. They've never shown aggression to humans, other dogs. They're protective over the house, well behaved, obedient dogs," she said. Keeton says she's thankful neither she or the police were injured. She said the situation could have been a lot worse. BWAHAHAHAHAAA! That's what you call a fun day at the nut house! "I was also scared that one of them would attack me." As a dog owner, if you make this statement you need to rethink your choice of pets. Normal dogs don't make you fear for your life. I can't even imagine living with 5(!) dogs period. Five dogs that you're scared of because they might attack you is beyond stupid. Pit owners are crazy stupid. I bet the neighbors are glad to have a few of those things gone. This is worse than stupid. Five dogs running together is a pack of dogs even if they're in a fenced-in backyard. Dogs fight. Fighting breeds of dogs really fight. No normal human being is going to be able to safely break up a fight such as this. I don't even know why police got involved. If one is dumb enough to let this happen, let the dogs finish the fight. Pick up the bodies. If one needs some more dogs, the local shelter can easily provide them. Why use gunfire to kill fighting dogs? Why not let the dogs settle this. Please note that if anyone else's dog was being attacked, I wouldn't say this. In that case, shooting is indicated. I don't think pitbull fighters kill the winning dogs in the fights to stop the fights. Fighting dogs are bred to fight; and, here again, the dogs were shot for doing exactly what they were bred to do. Who is shocked when a fighting dog fights dogs?